airline booking systems, or technical systems with complex computations with little data, ...... domain word Name of Type Char belonging to the defined. Fig. 9. Taking discourse functions to be additional elements of meaning ... sentence is used, we identified two basic types: 1) pragmatic functions of achieving. Chao-Hong Liu, Chung-Hsien Wu, and Matthew Harris. Department of Computer Science and Information Engineering. National Cheng Kung University, Tainan. clauses. That this tendency reflects literary artifice alone (as an attempt to .... Subject occurs in dependent adverbial clause: ... The independent variables were chosen to reflect potential intralinguistic .... latter isolated from other types of nouns in view of their unique favoring of VS ...... underlines the dominant significance. Trustees of Indiana University and Anthropological Linguistics are collaborating with JSTOR to digitize, preserve and extend access to Anthropological Linguistics. millennia. It underscoresthe pointthat Semitic languages are as interestingfor the long-termstability of their grammatical systems as forthe changes that occur in them. NOTE:Applicationvalue = SV; input = 0.827; log likelihood= -433-309; chi-square/cell = I.O6OO. One may develop a single account ofthe otherthree variables: all in all, VS clauses are geared towards introducing an unavailable subject into the discourse. Clauses with VS order are less encumberedby words- the clauses they occur in are short;related to this,the predicate itselftends to be intransitiveor a copular verb (kaan, saar), and the referentofthe subject noun itselfis drawn froma potentiallyinfinite,though individuallydelimitable,universe. Any subject noun phrase with a modifyingdemonstrativehas SV order in the BA corpus (twenty-twotokens in all, five of which with active participle predicates).By contrast,modifyingdemonstrativesin APA occurin both SV and VS subject phrases. same pattern in both languages. Extrapolating fromour broader discoursebased analysis (Owens, Dodsworth,and Rockwood2009; see section5 below),we proposethat underlyingthe morpholexicalpatternis a shared set ofbasic pragmatic constraints: available subjects, most prominentlypronouns and quantifiers,migrate towards SV order, while less available, new subjects, prototypicallyindefinitesubjects, tend towards VS. In both data sets, definiteand possessed nouns populate a middle ground. Before moving on to a discussion of the pragmatic constraints, some explanation concerningthe other independent variables is in order. Regarding numberofwords,the results are not completelycomparable, as the APA analysis counts words per clause, whereas the BA analysis counts words per subject noun phrase. Nonetheless, in the BA corpus, 70 percent of VS clauses have a single element in the subject noun phrase, as opposed to only 52 percentin the SV clauses. Furthermore,SV subjectshave a largerrange, containingup to fourteen words. So even here a tendencycan be discerned wherebySV is associated with heavier constituents,VS with lighter,as in the APA corpus. However, BA and APA differin terms of the relationship between word order and transitivity.Althoughthe transitivityvariable is not significantfor BA, the verb 'be' (DID (hwh)) occurs in SV order in eleven out oftwelve tokens, whereas in APA the verb 'be' (kaan/saar) favorsVS. Regarding the verb form variable that is mildlysignificantin the BA data, imperfectfavoringSV, perfect VS, in a number of studies on Semitic languages, a linkage has been drawn between perfectand VS order,on the one hand, and imperfectand SV, on the other. This has been argued forin Hebrew (Givón 1977; Fox 1983), BA (Buth 1987), and various Arabic dialects (Dahlgren 1998) on the basis ofan analysis of published texts. In addition, Cook (I986) draws a correlationbetween perfect and VO order and between imperfectand OV order. Holes (2009), on the other hand, notes that VS with imperfectverbs is common in Bahraini Arabic. In termsofpercentages,both perfectand imperfectin BA have dominantS V order. In Semitic languages, this variation has been explained by the discourse propertyof foregrounding,that is, highlightingwhat a story is about. Foregroundedeventsfollowa sequential timelinein a narrative,and, it is argued,VS and VO word order is chosen to representthis sequentiality. Given that narratives are oftenabout events that happened in the past, VS/VO associates with the perfect. 5. Event-based determinants. Again, takingthe lead fromour originalAPA study, we propose that SV/VS order in BA is sensitive to larger discourse segments,a crucial one being event-based frames(Myhill 1992; Buth 1987:140; Holes 2009 for Bahraini Arabic). Descriptions and narratives that sequence events and procedureswill favorVS.  The VS ordersignals the introductionofan essential, event-relevantreferent. semanticnature ofdefinitenouns furthercomes into play, with nouns ofgeneral All in all, meaning,such as 'people', patterningwith quantifiersand pronouns.23 the S of SV has a higher degree of availability, and its precise identityis less important,than the S of VS. 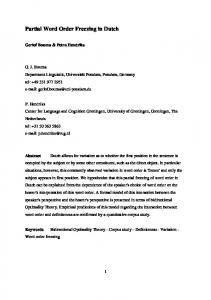 The properties of each are leveraged into a discourse complementarity:narratives achieve compactness in part by movingthe storyalong with the introductionofspecificreferentsin VS order.24 To conclude, we emphasize that the pattern of lexico-discourseword order described here was identifiedfroma corpus of contemporaryspoken Arabic, fromArabic dialects. 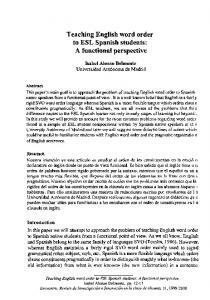 Whereas these are traditionallyviewed as younger offspring of Classical Arabic or of a formof Arabic contemporarywith Classical Arabic,the data and analysis presented here argues furtherforthe position of Owens (2009), namely,that contemporaryspoken Arabic is a reservoirofstructures and linguisticpractice that affordinsights deep into the historicalpast of Arabic,into an era older than Classical Arabic,and, as seen here in conjunction with furtherdata, intothe past ofSemitic languages in general. Notes APA = ArabianPeninsularArabic;BA = BiblicalAramaic;DEF = Abbreviations. definite;F = feminine;M = masculine;NOM= nominative;O = object;PL = plural; S = subject;SG = singular;SS/DS= same subject/different subject;V = verb.Wordorder = are abbreviated in the usual fashion: VS patterns order,SVO = subjectverb-subject = VSO and so on. order, verb-object order, verb-subject-object In transliterations of Biblical Aramaic,§ is used for'y. For the Transcriptions. sometimesambiguousAramaicvocalizationwe followRosenthal(1961:11), though transcribe both..and ..as /e/.Rosenthaldistinguishes theseas closed(longorshort)and and short We do notmarkpostvocalicspirantization in theAramaic open (respectively). ofArabic,D is used fora voiced,interdentalemphatic examples.In transliterations fricative. 1. Interestingly, Brockelmann thatit is (1982:170)is morecircumspect, suggesting "doubtful"(fraglich)whetherProtoSemitichad a fixedsubjectwordorderin verbal sentences.Garr(1985:191),whofollowsthe standingviewthatProto-Semitic was VS, observations on nominal,not supportsthisposition(n. 172) in partwithBrockelmann's verbalsentences.It can be noted,however,thatin a slightlylaterwork,Brockelmann withoutassociating speaksofa "strictly regulatedwordorder"(strengundfestgeregelt), thiswithanyspecificgrammatical categories(1916:20). AboutGafaz,Gragg(1997:255)saysthatthebasicwordorderis VSO, butthatother ordersare attestedas well. No characterization ofbasic wordorderis offered. Givón (1977) arguesthat BiblicalHebrewmovedfromVSO to SVO fromits earlierto later period. A further encountered motifin thedescription ofsubjectverbwordorder frequently in Semiticis thatifSV shouldbe encountered, it is because the subjectis givengreater emphasis(e.g., Garr 1985:189;Gragg 1997:255;the quotationfromKaufmann1997 above).This explanationis rarelyfollowedup withcorpusstudy,however,and in most cases itfollowsa different tackto ourfindings in regardsto BiblicalAramaic explanatory and ArabianPeninsularArabic,whereSV ordermarksgreaterreferential of availability thesubject. 2. We use thetermArabianPeninsularArabicas a heuristiconly,leavingopenthe questionwhetherthepeninsulashouldbe considereda singledialectarea. and Rockwood(2009). The corpusofBA is too 23. DiscussedbyOwens,Dodsworth, thisparameter. smallto investigate 24. It followsfromthe analysispresentedhere that the assumptionthat ProtoSemiticfollowedVSO order,as describedin section1, needs closerassessment.It does of notapplyto BA, norprobablyto anystageofAramaic,and underthe interpretation notto all varietiesof APA subjectand verborderas goingback to the protolanguage, Arabiceither. References Al-Rawi,Rosina-Fawzia und -lexik, StudienzumarabischenDialektvonAbuDaby:Nominalbildung 1990 Texte.Heidelberg:J. Groos. Gotthelf Bergsträßer, und grammatische in die semitischen 1977 Sprachen:Sprachproben Einführung Skizzen.Darmstadt:Wissenschaftliche Buchgesellschaft. Carl Brockelmann, Berlin:G. J. Gösching. SemitischeSprachwissenschaft. 1916 Grammatikdersemitischen Grundrissdervergleichenden Sprachen.Vol. 1982 2: Syntax.Hildesheim:Georg01msVerlag. Bückers,Hermann Vol. 4, Part 2: Die BücherEsdras, Nehemias, HerdersBibelkommentar. 1953 Tobias,JudithundEsther.Freiburg:Herder. Buth,John ofFunctionalGrammarand WordOrderin AramaicfromthePerspectives 1987 ofCalifornia,Los Angeles. DiscourseAnalysis.Ph.D. diss.,University Collins,JohnJoseph on theBookofDaniel.Minneapolis:FortressPress. Daniel: A Commentary 1993 Edward Cook, WordOrderin theAramaicofDaniel. Afroasiatic Linguistics9:111-26. 1986 Dahlgren,Sven-Olof ActaUniversitatis WordOrderin Arabic.Göteborg: Gothoburgensis. 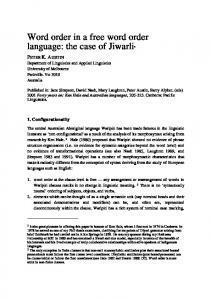 1998 Matthew Dryer, JournalofLinguistics27:443SVO Languagesand the OV:VO Typology. 1991 82. Edwards,Malcolm StrucWordOrderin EgyptianArabic:Formand Function.In Information 2009 turein SpokenArabic,editedbyJonathanOwens and Alaa Elgibali,93106.London:Routledge. Faber,Alice ofthe SemiticLanguages.In The SemiticLanguages, GeneticSubgrouping 1997 editedbyRobertHetzron,3-15. London,Routledge. Folmer,Margaretha The AramaicLanguagein theAchaemenidPeriod.OrientaliaLovaniensia 1995 Analecta68. Leuven:Peeters. 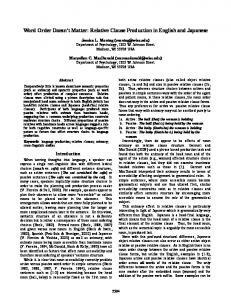 Andrew Fox, 1983 Topic Continuityin Biblical HebrewNarrative.In Topic Continuityin Discourse:A QuantitativeCross-LanguageStudy,editedbyTalmyGivón, JohnBenjamins. 215-54.Amsterdam: Randall W. Garr, Dialect GeographyofSyria-Palestine, IOOO-586B.C.E.Philadelphia:Uni1985 versityofPennsylvaniaPress. 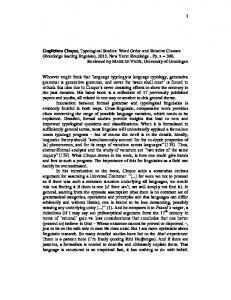 Givón,Talmy The DriftfromVSO to SVO in BiblicalHebrew:The PragmaticsofTense1977 Aspect.In MechanismsofSyntacticChange,editedbyCharlesN. Li, 181ofTexas Press. 254. Austin:University Grabbe,LesterL. Ezra-Nehemiah.London:Routledge. 1998 Gragg,Gene G8Î8Z. In The SemiticLanguages, edited by RobertHetzron,242-62. 1997 London,Routledge. Horvath,BarbaraM., and RonaldJ.Horvath A Closer Look at the ConstraintHierarchy:Order,Contrast,and Geo2003 graphicalScale. LanguageVariationand Change15(2):143-70. Clive Holes, WordOrderand TextualFunctionin GulfArabic.In Information Structure 2009 in SpokenArabic,editedby JonathanOwens and Alaa Elgibali,6I-74. London:Routledge. Kaufman,Stephen Aramaic.In The SemiticLanguages,editedby RobertHetzron,II4-30. 1997 London,Routledge. eds. Kittel,Rudolf,Paul Kahle,Albrecht Alt,OttoEissfeldt,and WalterBaumgartner, BiblicaHebraica.I6th ed. Stuttgart: Bibelanstalt. 1971 Württembergische Lipiñski,Edward 2000 The Aramaeans: Their AncientHistory,Culture,Religion.Orientalia Lovaniensiaanalecta100.Leuven:Peeters. Muraoka,Takamitsu,and Bezalel Porten A GrammarofEgyptianAramaic.2d rev.ed. Leiden:Brill. 2003 Myhill,John WordOrderand TemporalSequencing.In PragmaticsofWordOrderFlexi1992 bility,editedbyDorisPayne,265-78. Amsterdam: Benjamins. and SebastiãoVotre Naro,Anthony, DiscourseMotivationsforLinguisticRegularities:Verb/Subject Orderin 1999 SpokenBrazilianPortuguese.Probus11:75-100. Owens,Jonathan 2000 The StructureofArabicGrammaticalTheory.In HistoryoftheLanguage Sciences: An InternationalHandbookon the Evolutionof the Studyof Languagefromthe Beginningsto the Present,editedby SylvainAuroux, 286-300.Berlin:Walterde Gruyter. A LinguisticHistoryofArabic.Oxford:OxfordUniversity Press. 2009 Owens,Jonathan,and MaratYavrumyan The Participle.In Encyclopedia ofArabicLanguageand Linguistics, edited 2007 byC. H. M. Versteegh, 541-46. Leiden:Brill. and TrentRockwood Owens,Jonathan,RobinDodsworth, Verb Order in Spoken Arabic:Morpholexicaland Event-Based 2009 SubjectFactors.LanguageVariationand Change21:39-67. Prince,Ellen F. Towarda Taxonomyof Given-NewInformation. In Radical Pragmatics, 198I editedbyPeterCole,223-55. NewYork:AcademicPress. Retsö,Jan 2000 ofAncientArabia.Oriente Kaskasa, T-Passivesand theDialectGeography Moderno,n.s.,19:111-18. The Arabsin Antiquity: TheirHistoryfromtheAssyrians totheUmayyads. 2003 London:RoutledgeCurzon. Rosenthal,Franz A GrammarofBiblicalAramaic.Wiesbaden:O. Harrassowitz. 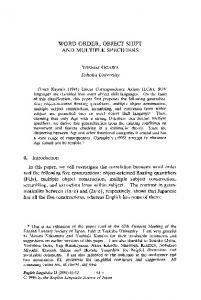 I96I Sankoff, D., S. A. Tagliamonte,and E. Smith GoldvarbX: A MultivariateAnalysis.Retrievedfromhttp://individual. 2005 utoronto.ca/tagliamonte/Goldvarb/GVJndex.htm Steuer,RitaMaria,ed. Das alte Testament.Vol. 5: Sprichwörter, Ruth,Das Hohelied,Prediger, 2003 Klagelieder,Esther, Daniel, Esra, Nehemia, 1. Chronik,2. Chronik. Hänssler. Neuhausen-Stuttgart: Tallerman,Maggie CelticWordOrder:Some TheoreticalIssues. In ConstituentOrderin the 1998 LanguagesofEurope,editedbyA. Siewierska,599-647.Berlin:Moutonde Gruyter. 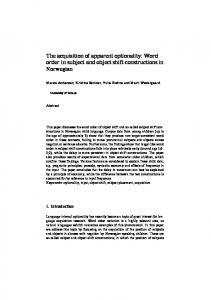 Report "Stability in Subject-Verb Word Order: From"